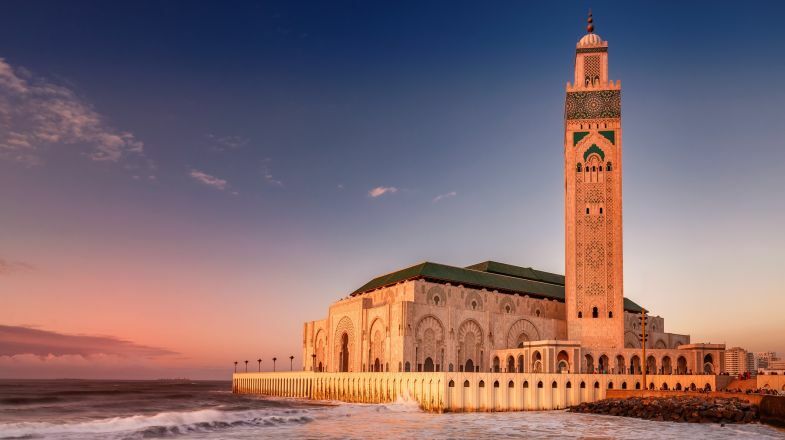 Visit the grand Mosque of Hassan II in Casablanca, one of the most impressive temples in Morocco, before exploring the sights of the country's first imperial city of Meknes. Under the eye of a local tour guide, feel like you've travelled back to the Middle Ages in the labyrinthine medina of Fes. Trek through scenic countryside and traditional villages in the Atlas Mountains. Get lost in the Medina of Fes. Visit the Roman ruins of Volubilis. Entrance fees to all sights in the itinerary. Fes: Join in the fun at a colourful Moroccan feast, complete with rhythmic music, writhing belly dancers and an array of local dishes and delicacies..
Dades Valley: Stop at a traditional Nomad house and meet the locals as you try Berber tea..
Casablanca: You must remember this...a fabulous 4-course Celebration Dinner with drinks at Rick’s Café, made famous by the 1942 film.. Widely regarded as Morocco's holiest place, overnight visits to Moulay Idriss were prohibited to non-Muslims until 2005. Enjoy plenty of time to practise your photography among the vivid blue houses of Chefchaouen. Relive a glorious medieval past in Fes city. Scale the High Atlas Mountains and trek through scenic Berber villages, spending a night in a traditional Berber homestay. Negotiate your way through the winding alleys of Ait Benhaddou Kasbah, a superb example of Moroccan architecture rich in history and mystery. Moroccan cuisine is interpreted throughout the world in different ways. Marvel at the size of the Mosque of Hassan II, which dominates the Casablanca skyline – this massive edifice is the largest in Africa and second only in the world to the great mosque at Mecca. Uncover one of the most remote parts of the Roman Empire, and the most impressive Roman ruins in Morocco, at the UNESCO World Heritage site of Volubilis. Enjoy the magical atmosphere and hospitality of feature stay in traditional Riad in Meknes, house with interior garden, fountain and beautifully decorated rooms. Views of the impressive Hassan II Mosque in Casablanca. Historic Ismalian capital of Meknes. Wander the winding streets of ancient medinas.. Explore natural gorges and Roman ruins.. Discover Marrakech on a city tour. Enjoy stargazing in a Berber Campsite in Erg Chebbi. Explore Meknes, Volubilis & Moulay Idriss. Travelling to Morocco? Chat with a local travel specialist in Morocco who can help organize your trip. Morocco is an exotic country that never stops amazing you with its sights and surrounds. From ancient towns to chaotic cities, from remote villages to gorgeous coastal resorts, the country presents a variety of things to see and do that are sure to cater to all kinds of travelers. Beautiful golden sand beaches, a long coastline that borders the Mediterranean Sea and the Atlantic Ocean, four majestic mountains, vast open expanses of the great Sahara Desert, exotic vineyards and cascading rivers; some of the many beautiful things a tour to Morocco willoffer. Once you’re done with that natural beauty, you can also choose from urban explorations, desert towns such as Ouarzazate (yes, this is the town featured in movies like Prince of Persia: Sands of Time and Kingdom of Heaven). Exchanging money before your trip can be difficult due to Morocco’s currency laws that prevent you from bringing more than 1000 Moroccan Dirhams in or out of the country (the equivalent of about US$106). Set aside time at the airport upon arrival to exchange your currency. Visitors, like Moroccans, are expected to dress conservatively, especially women. Cover your shoulders, knees and chest as much as possible. Always ask permission before taking photographs of locals, particularly in rural areas. Some believe cameras can capture a person’s soul using black magic, so asking is always a respectful gesture. Be sure to pack layers, as temperatures can drop drastically at night, particularly in the winter. At the same time, daytime temperatures can exceed 40 degrees Celsius in the summer! As a Muslim country, Friday is the weekly holy day in Morocco. Many shops will be closed on Fridays (particularly after midday) so locals can attend prayer, so buy what you need beforehand. Morocco has seasonal weather so please do check up on the best time to visit Morocco before planning your tour. And if you’re still hunting for more things to do and places to explore in Morocco, do check out our Morocco Travel Guide for more information.